I haven’t been doing a lot of sewing lately. Between parenting, part-time work, and study I haven’t had much time for myself. To make matters worse I rushed into a couple of projects that didn’t work out which is always so disappointing… so I haven’t been feeling very inspired over the last couple of weeks. But now I have had a little break I can feel my sewjo returning slowly! While I continue gearing up for some summer sewing, I wanted to share one final make from winter: this lovely Diode beanie. I learnt to knit when I was a little kid but I have only dabbled occasionally as an adult. So even though I’ve known the basics most of my life I still consider myself a beginner – or maybe an advanced beginner. The Diode pattern, by Erica Smith, is great for advanced beginners. I would recommend it to anyone like myself who has mastered the basics and wants to try a slightly more complicated pattern. 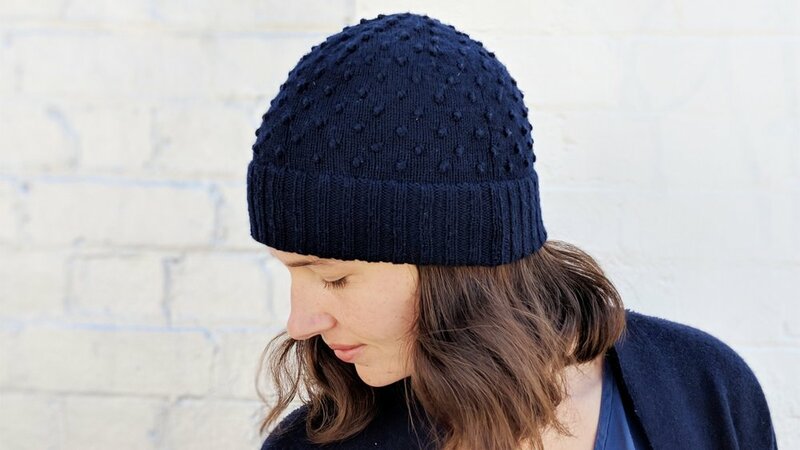 A great feature of this pattern is the double-knitted ribbed brim. It takes twice as long to knit as a regular brim but all that effort is worth it. The final product is warm and comfortable with a professional look. The pattern on the hat is created by knitting little bobbles which I had never done before. At first I was very intimidated by the idea. However, after some YouTube research I felt confident to give it a go – and like most things it was a lot easier than I had expected. The finished pattern is lovely, particularly the way it spirals in at the top of the hat. This pattern is supposed to be slouchy but I wouldn’t describe my finished hat this way… Perhaps this is because I am quite a tight knitter. Or maybe I wear my hats lower than most people. Either way, while it may not be slouchy, it is still a great shape. I should note, it was not a great shape when I finished knitting it! I was a little worried until I blocked it properly. This is not the project to skip blocking. I used some Chickadee yarn by Quince and Co in Pea Coat (Navy). This Sport/ DK weight yarn is 100% wool. I purchased my yarn at a gorgeous shop called Calico and Ivy. If you live in Perth you must go and check it out. They have beautiful knitting and sewing supplies. I could spend a fortune in there! My big tip about this pattern is don’t buy too much yarn. The pattern says you will need between 375 - 400 yards of yarn to complete this project. If you are a tight knitter like me, I think this is an over-estimate. I used just under 2 skeins of Chickadee yarn which are 181 yards each. This means I used less than 362 yards of yarn. Although I thought I would need three skins, I’m glad I only purchased two to begin with as I saved myself $18. This beanie is the first time I have felt really happy with an item I have knitted myself. 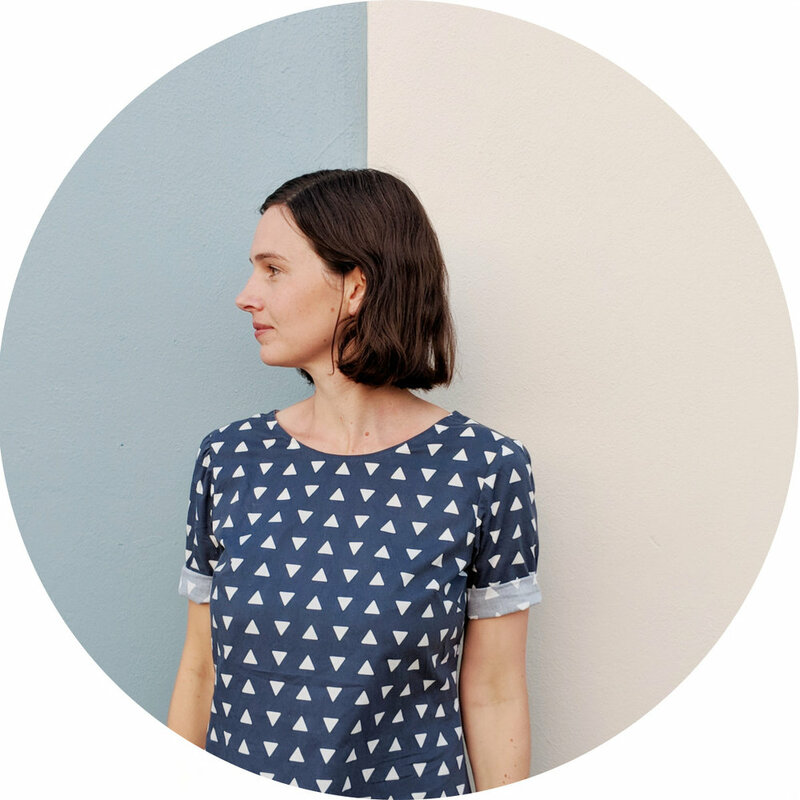 I’m wearing it in three of my most recent blog post photo shoots which is a good indication of how much I love it! I think I will be wearing it for years to come. After completing this project I feel a lot more confident deciphering knitting patterns and excited to make myself some more knits for next winter.